The home buying process can seem long and drawn out, but are there ways to speed up the process and buy a house fast? Definitely! No matter what your situation is or why you need to close a loan quickly, there are steps you can take to make it happen sooner. How Long Does it Usually Take to Buy a House? There are many opinions on how long it takes to buy a house and it varies with the housing market, your housing needs, and the area you live in. Typically, the house hunting period lasts one to two months. Once your offer is accepted, the closing process typically takes 30 to 60 days. In general, it’s safe to assume that from the time you start looking, until you get the keys, this process can take up to 4 months. But it does not have to take that long! There are many things you can do to speed up the process and cut that amount of time in half. Depending on the situation, you may be able to close on your home in under 30 days. There are many reasons why buyers need to move quickly and maybe one of these situations applies to you. Do you fall into one of the following categories? If you find yourself in one of these situations or have another reason why you may need to buy a house fast, then we’ve got some helpful tips for you to shorten up the amount of time it takes. We’ve got several ways you can work to shorten up the amount of time your homeownership journey takes. Make decisions now so you don’t waste time later. Decide exactly what you are looking for in a house, neighborhood, etc. and don’t make it so specific that you have a hard time finding a home that fits. Start preparing all the paperwork you’ll need for the loan process - begin with 2 months of bank and financial statements, as well as copies of recent pay stubs, W-2s, and tax returns. Getting the pre-approval ahead of time will mean that you have already turned in most of your paperwork and gone through underwriting, shortening up the process when you actually buy; you’ll know exactly what price of home you can afford so you don’t waste time looking at anything out of your range. The other benefit of being pre-approved is you may be able to improve your purchase offers, which could increasing your buying chances, because the seller knows you have been fully approved for financing. Find a realtor who is an expert in the area where you want to purchase a house. They can help you focus only on the houses that will fit your situation. Additionally, they can help you navigate the buying steps and negotiate on your behalf. Answer questions and requests for paperwork as soon as you possibly can. Provide documentation right away. Keep your calendar flexible so you can schedule appointments and inspections quickly. 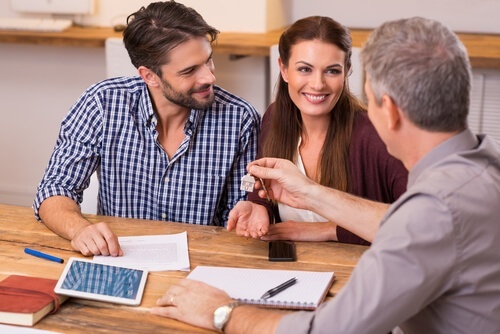 Working with an APM loan advisor before you start shopping for a home is a great way to speed things up. They can answer your questions and help you prepare. Keys on Time Program - Strengthen your purchase offers with this program that combines a full pre-approval with a quick close (typically less than 30 days). With Keys on Time you can waive your loan contingency when you make your purchase offer because you have been fully pre-approved, putting you at the front of the line. Bridge Loan Program - Enables you to make an offer on another home before yours is sold so you can remove the sales contingency, making your purchase offer stronger. By preparing ahead, working carefully with the right professionals, including our helpful loan advisors, and following our tips - you’ll be ready to buy a house fast. Be sure to download our Home Buyer Checklist to help you prepare - it simplifies the home buying process and takes you through it step-by-step.